Check out Tobi's Lucky Lady Lace Up Dress Get lucky with the Mauve Lucky Lady Lace Up Dress. Featuring a high neck choker and a racerback lace up detail, this scallop lace dress might be the lucky break you need. Wear to weddings with cocktail attire or to strut your stuff at homecoming. Break a leg, babe! Get lucky with the Mauve Lucky Lady Lace Up Dress. Featuring a high neck choker and a racerback lace up detail, this scallop lace dress might be the lucky break you need. Wear to weddings with cocktail attire or to strut your stuff at homecoming. Break a leg, babe! 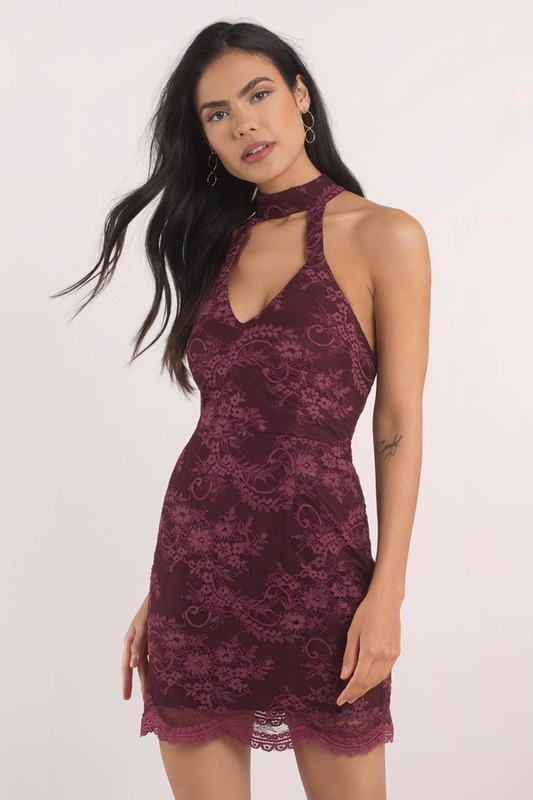 Get lucky with the Wine Lucky Lady Lace Up Dress. Featuring a high neck choker and a racerback lace up detail, this scallop lace dress might be the lucky break you need. Wear to weddings with cocktail attire or to strut your stuff at homecoming. Break a leg, babe!